Saturday was fun. 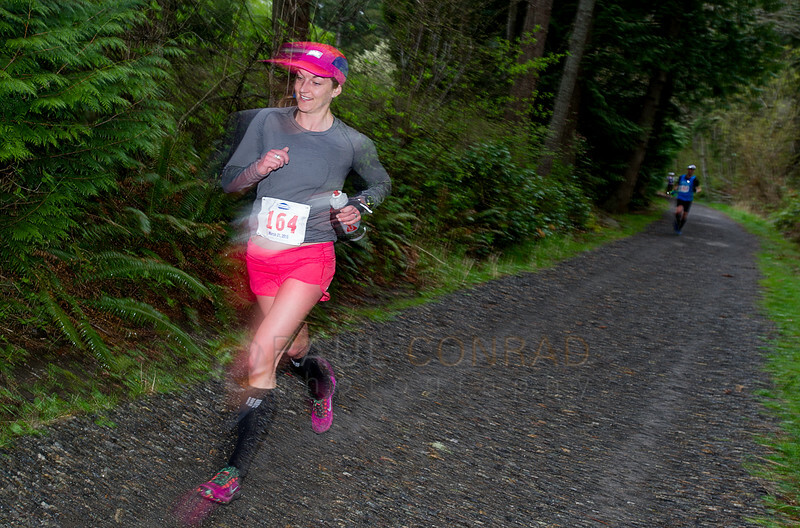 Got a nearly last-minute phone call to cover the Chuckanut 50K Ultramarathon for The Bellingham Herald. The 31.5 mile race was phenomenal to shoot, but a logistical nightmare. 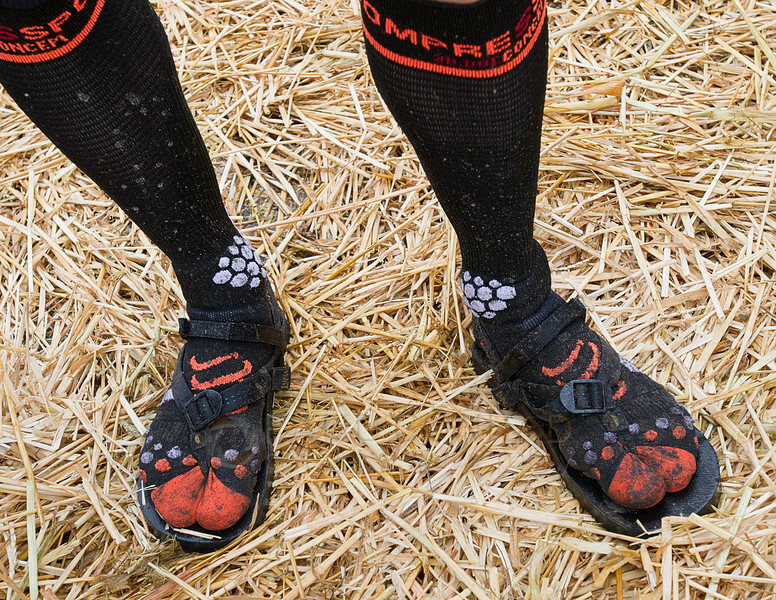 © Paul Conrad/The Bellingham Herald – Jason Loutitt, 40, of Vancouver, B.C., ran the entire 50 kilometers in socks and sandals during the 2015 Chuckanut 50K on Saturday morning Mar. 21, 2015. Loutitt won 4th place overall with a time of 3:53:58. 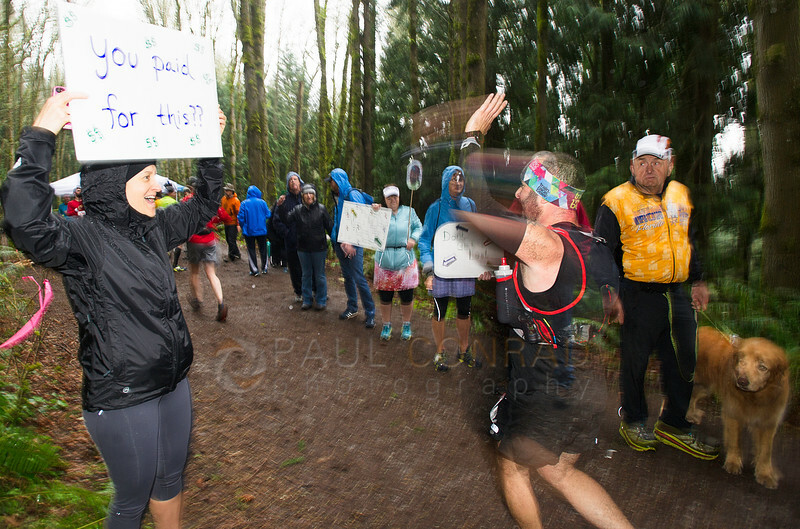 The race started in Fairhaven, went onto the Interurban Trail where it paralleled Chuckanut Drive, then split into 4 different courses on Fragrance Lake Trail checkpoint, those then wound back to that same checkpoint with the final leg as the reverse of the first. 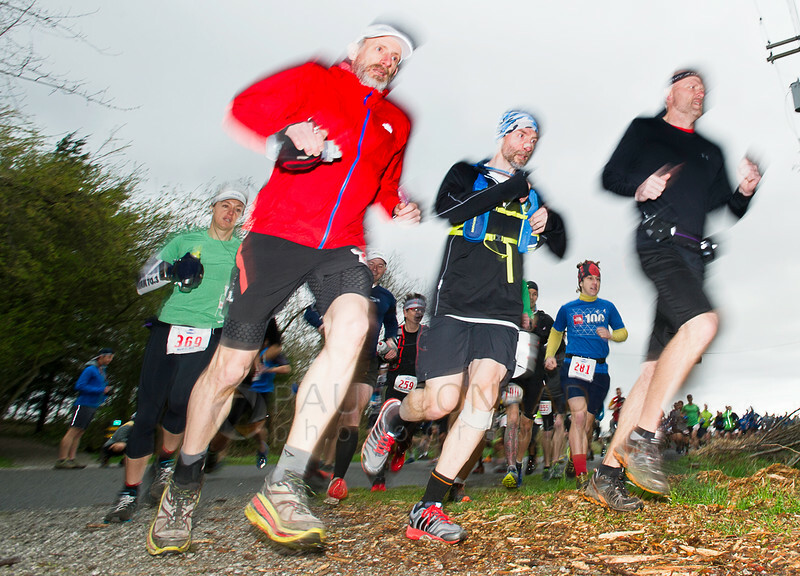 © Paul Conrad/The Bellingham Herald – Competitors turn the first corner after leaving the 2015 Chuckanut 50K start at 6th and Harris in Fairhaven, Wash., on Saturday morning Mar. 21, 2015. The start was easy. Just waited for the runners to begin coming at me. I did plan on shooting wide while using a flash to light them as it was dark and gray. So I got on the ground and worked a few images. 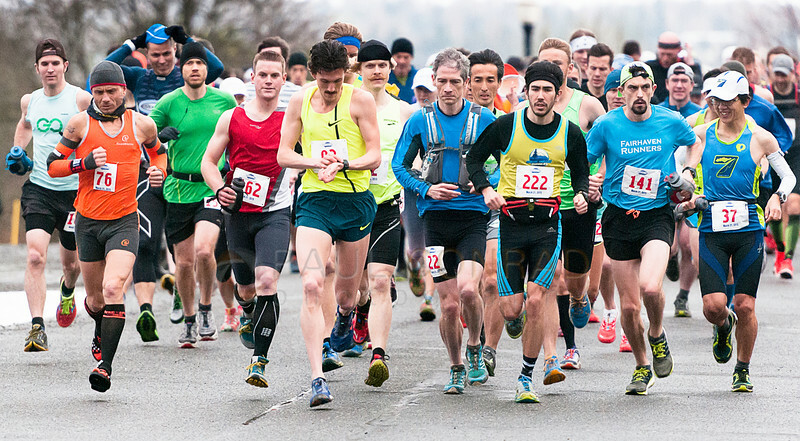 © Paul Conrad/The Bellingham Herald – David Laney (92) of Ashland Ore., yellow shirt center, sets his time as he leads the pack from the start line of the 2015 Chuckanut 50K at 6th and Harris streets in Fairhaven, Wash., on Saturday morning Mar. 21, 2015. Laney won the race with a time of 3:40:27. After shooting the start, I drove to Cleator Road and waited for the first group of runners so I can get some on one of the trails. While waiting, I tested out the exposure settings my Nikon SB-810 Speedlight mounted on the paper’s D3s. But I could not find the rear curtain sync. After about 10 minutes, I headed to the checkpoint. © Paul Conrad/The Bellingham Herald – Care Nelson of Victoria, B. C., runs along the Interurban Trail during the 2015 Chuckanut 50K in Fairhaven, Wash., on Saturday morning Mar. 21, 2015. At the checkpoint, a group of 100 supporters and spectators cheered each racer as they ran by. I liked the camaraderie so I stayed and shot the cheering. © Paul Conrad/The Bellingham Herald – Trudy Marino of Ferndale, left, cheers runner Benjamin Perri of Seattle as he nears the first checkpoint at the intersection of the Interurban and Fragrance Lake Trails during 2015 Chuckanut 50K in Fairhaven, Wash., on Saturday morning Mar. 21, 2015. Marino says she was waiting for her friend Jesse Lenley as he was competing in the ultra marathon. After about half an hour, it was time to head back to the finish line. There was a good hour and a half wait until the first runner finished. His finish was not as fast as his other races. © Paul Conrad/The Bellingham Herald – First place winner David Laney of Ashland Ore., left, is comforted by his girlfriend Jana Suddock, right, as a medical technician asks questions about his condition after he completed the course with a time of 3 hours, 40 minutes and 21 seconds in the 2015 Chuckanut 50K in Fairhaven, Wash., on Saturday morning Mar. 21, 2015. Laney won with a time of 3:40:21. One this I make sure I get: reaction. Whether that reaction is good or bad, I try to get it. Plus, I look for congratulatory moments. 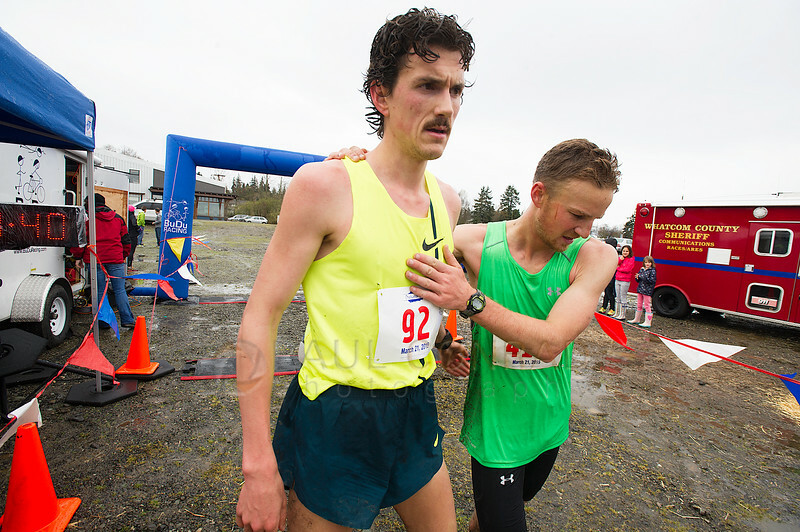 © Paul Conrad/The Bellingham Herald – First place winner David Laney (92) of Ashford, Ore., left, is congratulated by second place winner Andrew Benford (410) of Flagstaff, Ariz., after the two completed the 2015 Chuckanut 50K in Fairhaven, Wash., on Saturday morning Mar. 21, 2015. Laney won with a time of 3:40:21 followed closely by Benford with a time of 3:40:34. So a big tip for everyone out there: Learn your camera settings and what buttons to push. I’ve never used flash on the D3 so I was in the dark as to where to set the rear curtain synch. If I had cell service, I would’ve googled it. ← A vs B: Which One Would You Choose for the Front Page?